Are you one of the lucky overseas voters who has never had to worry about getting a ballot in the mail on time? Beware! With the MOVE Act of 2010, your ballot can be contested and even rejected in a recount when there is no proof of the ballot having been requested. Overseas voters must request their ballots each election cycle. Registering to vote through votefromabroad.org is the safest and easiest way to vote because Democrats Abroad has recently launched a new and improved version. It has never been easier! And NOW is the time to do it as State registration deadlines can be as early as 3 October. You might get your ballot twice, but you will be sure your vote will count. It is possible for us to get the majority in Congress and keep the Senate. Just imagine what the next years could be like if we don't? There is too much to do and too much at stake for us to let that happen! If you have volunteered in the past, or have contacted us recently, please let us know once again if you can help between now and November. We are all volunteers, we all care, and we welcome you. Don't wake up on November 5th and wish you had done more! States began accepting absentee ballots on September 19, so be sure your vote counts by returning your ballot right away. Haven't received your ballot yet? Are you registered to vote? Exercise your right to do so without delay as eligibility deadlines for this election cycle are approaching. Voter registration and absentee ballot requests are on the same form, so you can do both steps at once. 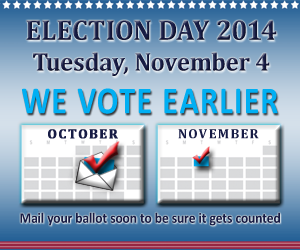 Elections offices start mailing ballots at least 45 days before the election. Vote as soon as it comes to avoid losing it, forgetting about it, or missing the deadline. Your completed ballot must be physically in the possession of your local elections Office by the deadline—a postmark on that date will not suffice. If you have not received a ballot at least 30 days before the election, vote using the Federal Write-In Absentee Ballot (FWAB) by mailing it to your local elections office. Each state has its own rules and procedures, so review the guidelines applicable to you. Here's a handy overview of request deadlines and ballot due dates. Many states now provide status tracking of your registration and/or ballot request and receipt online. Find the website in the Voter Information Directory. You can always contact your local county elections officials directly for clear and up-to-date information. They are friendly and ready to help. DA is targeting 11 Senate and 24 House races in which our votes from Switzerland could be critical in these very close contests. All Americans welcome to come register to vote and get your questions answered. Where : Avenue du Mont-Blanc 27 (at Rue du Midi), 1196 Gland – easy walk from Gland train station. Over 130 exhibitors of goods and services geared to the English-speaking community in Geneva and beyond. 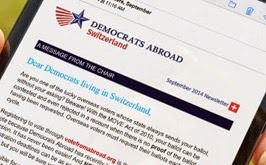 Democrats Abroad Switzerland will once again have a stand to sign up new members and help inform Americans on voting rights while living abroad. Come, meet us, and register to vote! Open House: discover everything this club has to offer. Democrats Abroad Switzerland will be present for voter registration. Organized by the Zurich Chapter of Democrats Abroad Switzerland, this visit is hosted by Member of Parliament Mrs. Barbar Gysi. Find out about the races from the candidates themselves online via WebEx! Details soon. Are you a veteran or part of a military family? A new opportunity to keep up with vets running for office, legislation, and news about veterans affairs is in the works. DA and Democratic National Committee member John Eastwood wants to open a channel between interested members of Dems Abroad and the DNC’s Veterans and Military Families Council. © 2014 Democrats Abroad Switzerland. All rights reserved.